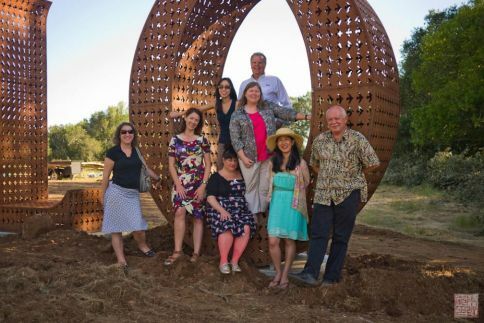 A few months ago, I was invited with some other bloggers to go on a three day trip to Sonoma County by Wine Road. 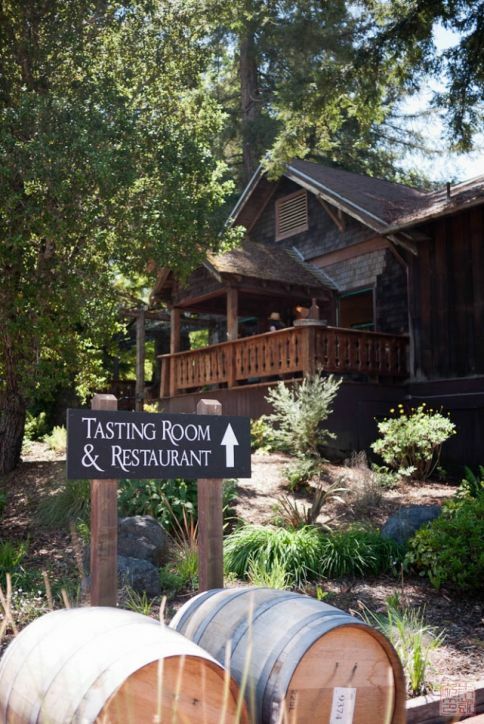 The Wine Road is an association of wineries in the Northern Sonoma county, near the Russian River, centered roughly around Healdsburg. 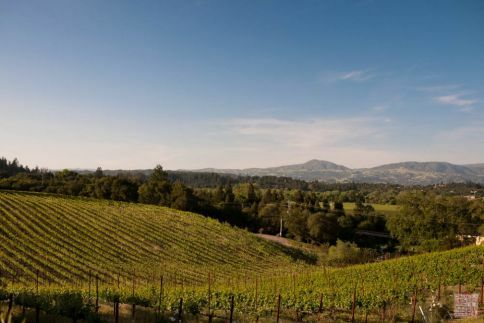 Although I always love going up to wine country, I’ve really found myself leaning towards the Sonoma area in recent years: the atmosphere is more relaxed and rustic, and there’s so many little eccentric wineries tucked away in unexpected corners. 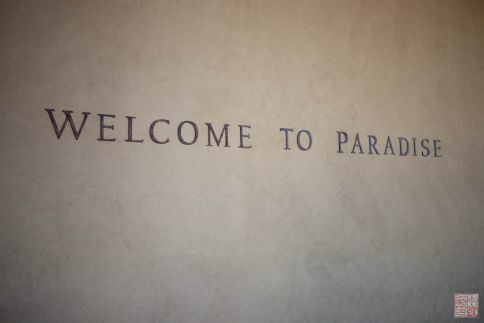 I gladly accepted this invitation! 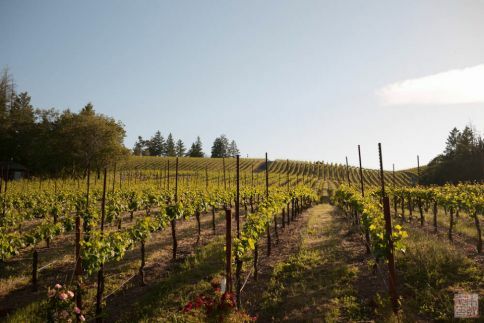 There are three main regions, or AVAs (American Viticulture Areas) that comprise the Wine Road: the Alexander Valley, Russian River Valley, and Dry Creek Valley. We got to spend a day exploring what each area had to offer. Below are some highlights from a dizzying (sometimes literally) three days on the wine road! 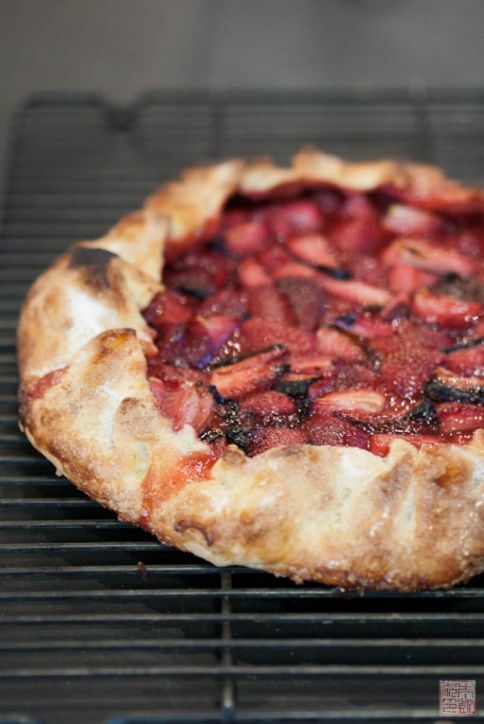 My anticipation for this trip grew even higher when I found out I knew several of the other bloggers, including the lovely Tomato Tart, who generously gave me a ride up to Sonoma. 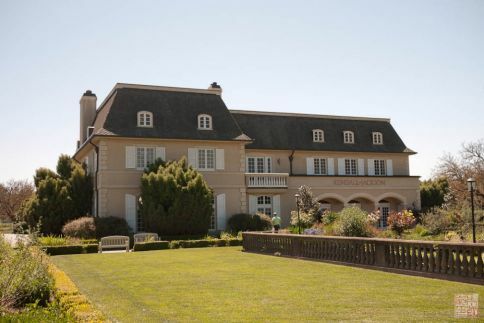 After arriving in Healdsurg and checking in to our respective hotels, everyone congregated at Williamson Wines in Geyserville to meet our hosts, and enjoy our first wine tasting of the day and lunch. 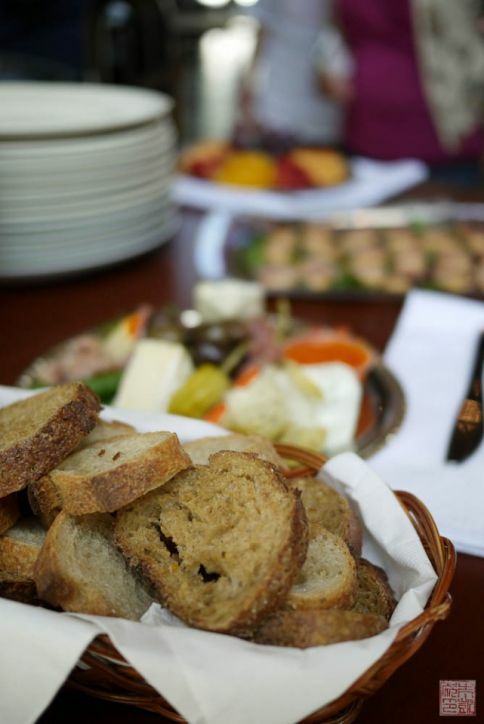 Williamson provided six wines to pair with a summer-perfect spread from Catelli’s. The sparkling cuvée and Chardonnay were particularly welcome on an already-warm day in wine country. The lovely back patio at the tasting room where we got to enjoy lunch. 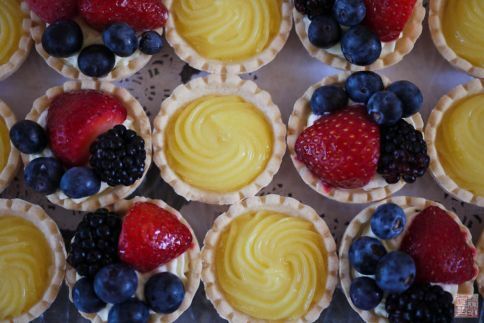 I couldn’t skip dessert: fresh fruit and lemon curd tartlets. 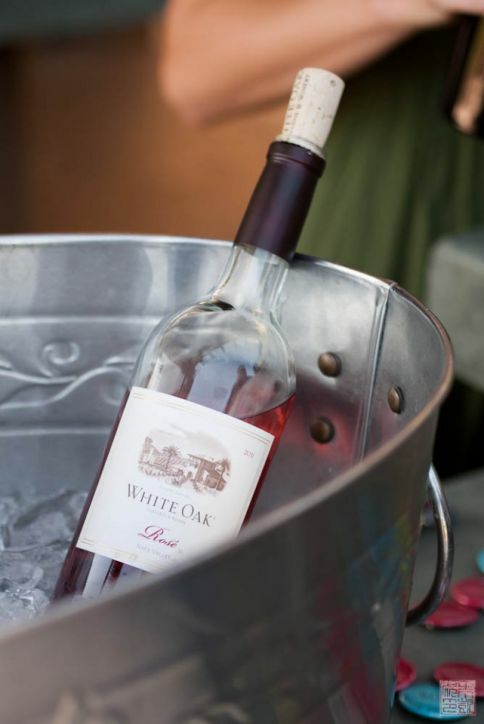 A lovely chilled rose at White Oak Wines – nothing better for a sunny afternoon. After driving (via tour bus) through endless golden vistas of grapevines, it was nice to stop at a winery and step out to enjoy the weather. The owner himself, Bill Myers, was on hand to greet us and invite us to have a glass. The White Oak winery also has a gorgeous outdoor kitchen for entertaining. 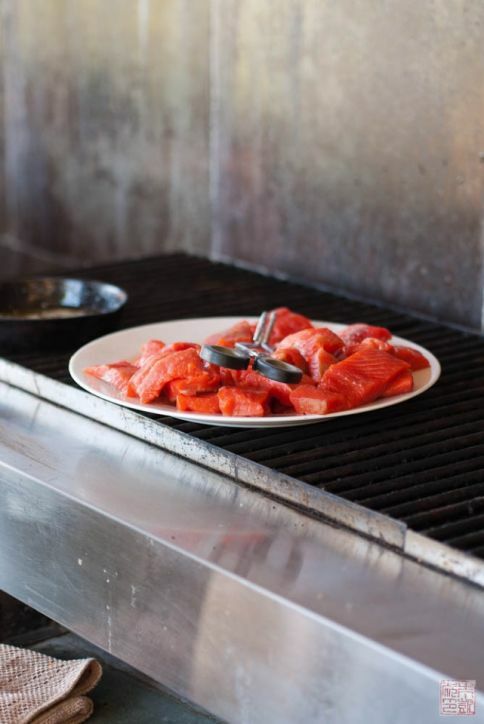 The winery was nice enough to give us a demo – here’s some salmon ready to be cooked. 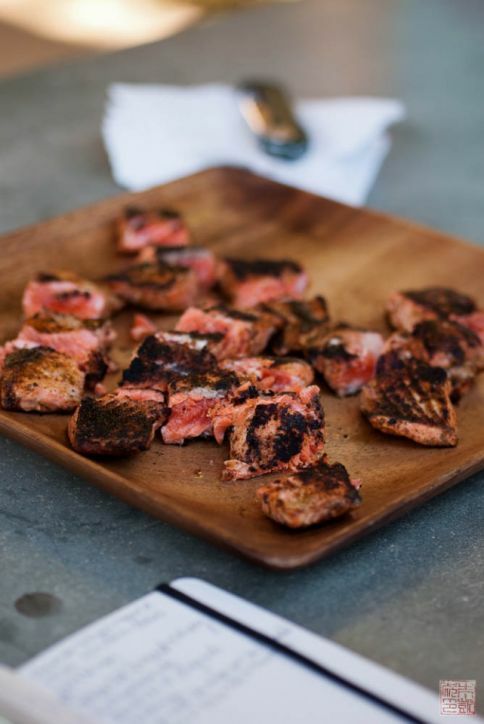 Bill himself made the blackened salmon for us, which went perfectly with their Zinfandel. 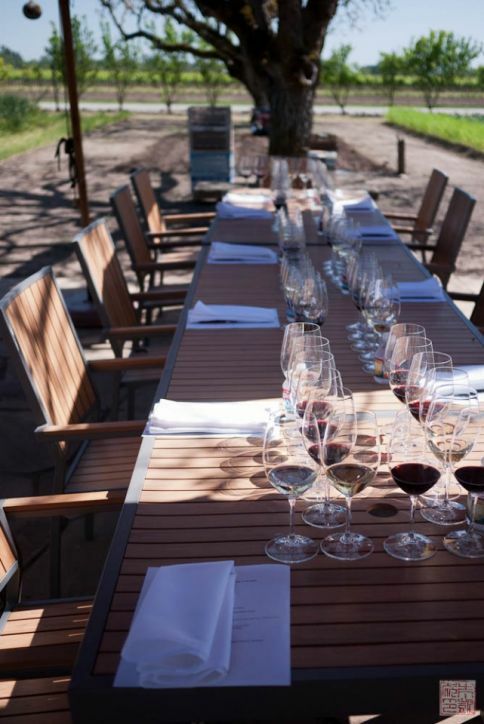 I really enjoyed the casual elegance of the place – this was exactly how I would want to spend a day up in Sonoma. We finished off the day by returning to Healdsburg for dinner at Relish Culinary Adventures, a culinary center that offers cooking classes, tours, and other food-related events in Sonoma county. Here is Chef Ciara Meany preparing dinner for us. 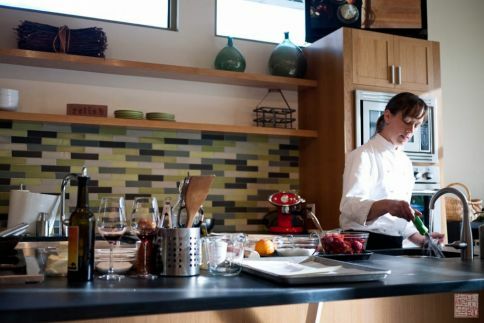 One of the classes Relish offers is a food and wine pairing class, where students can learn to cook several dishes (or see them demo’ed), and then try them with different wines. Ciara did all the cooking for us so we just had to sit back and enjoy. 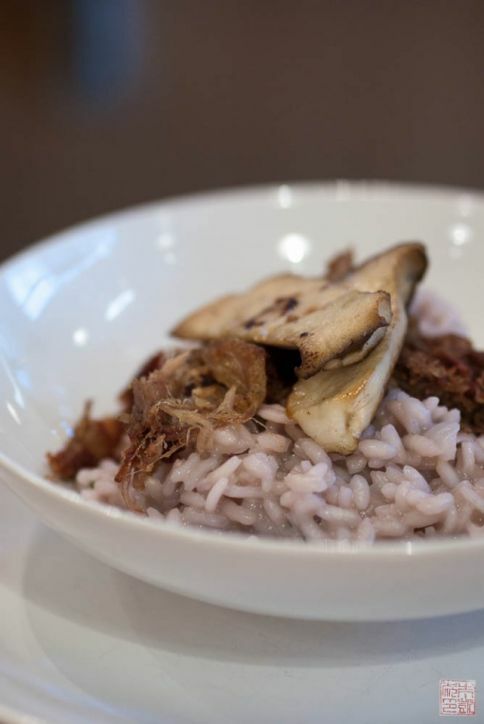 After an asparagus and goat cheese tart and a shrimp and avocado salad, we got to the main course of duck and mushroom risotto, probably my favorite dish of the evening. Although we were given two reds (not surprisingly) to go with the risotto, some of us tried it with the rose we had been given for the previous course and found it surprisingly refreshing. It was certainly a good setup to discover some unorthodox pairings that you otherwise wouldn’t have considered. 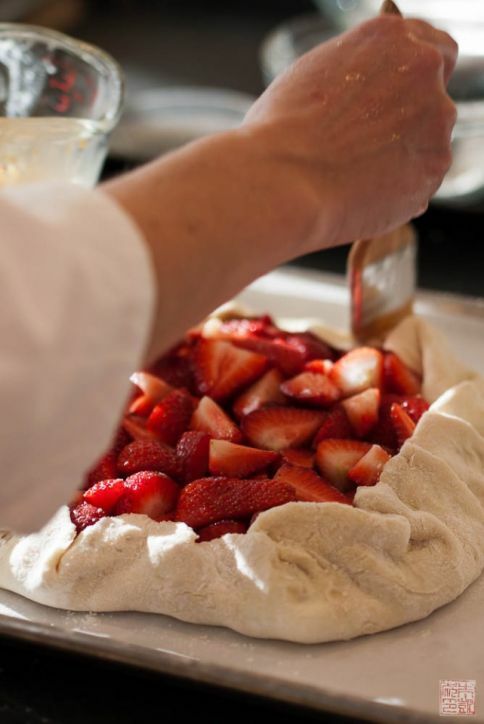 Chef Meany preparing dessert – a strawberry and rhubarb galette. The finished galette, a thing of beauty. Almost too much for us after a full day of food and wine – but you know I can never say no to dessert! 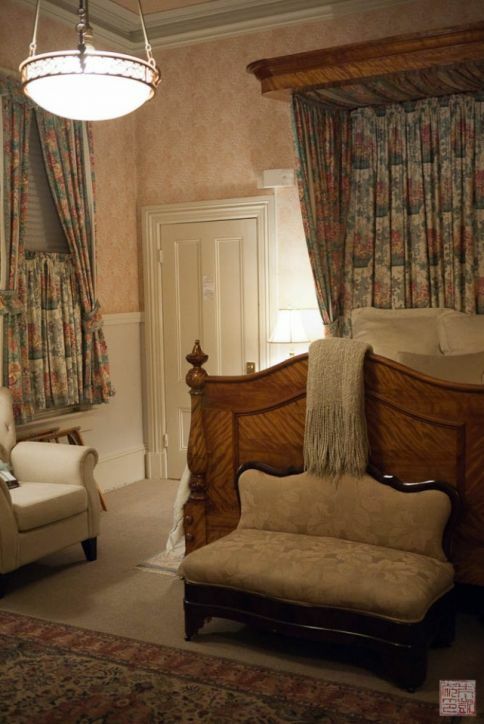 A shot of my room at the Camellia Inn in downtown Healdsburg. 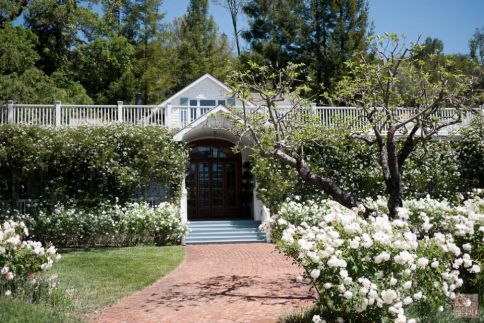 This Italianate Victorian B&B is a fixture of the town and has over 50 varieties of camellias on the property. It made a very comfortable home base during my wine road stay – thanks, Camellia Inn! A beautiful morning at Thomas George Estates. We were given a tour of the grounds by president and co-owner Jeremy Baker. Baker is a bit of Renaissance man: he started a restaurant group, did heli-skiing, and is an accomplished cook, among other things. He took to winemaking with the same passion he brought to his other endeavors. 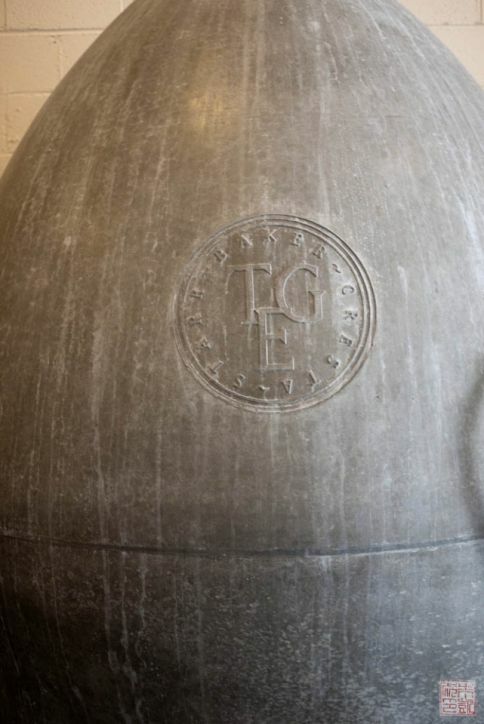 The concrete “egg” fermentation tank – the use of concrete tanks instead of barrels to age wine is an old technique that’s come back in popularity. Concrete doesn’t impart wood flavors into the wine like barrels do, resulting in a different flavor profile. Try their Chardonnays if you want to taste the difference. 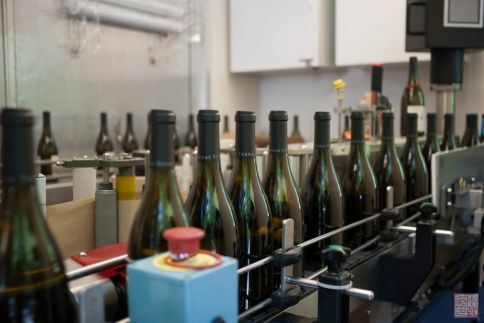 Wine being bottled by a mobile bottling service. Since Thomas George is a relatively small operation, they do not have their own bottling facilities on site and use a service instead. It was pretty cool to see this whole process going on inside a (large) truck! 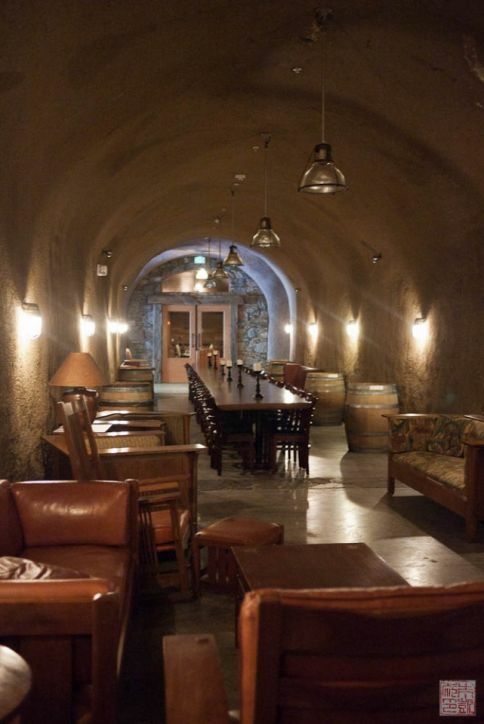 The impressive wine cave, where visitors can relax and taste the wine. Definitely a cool respite from the warm outdoors, and a dramatic event space. Lunch at Corks, with wines from Russian River Wineyards. Truffle fries and fried chicken were the order of the day. In the afternoon we went to Paradise Ridge Winery for a speed tasting event with ten wineries. 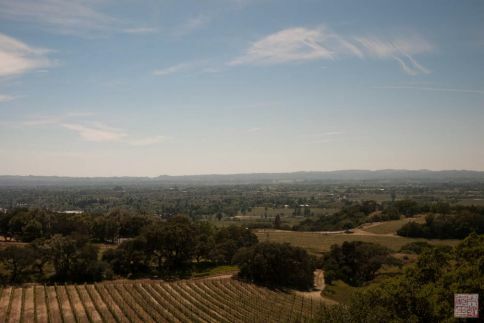 Paradise Ridge is aptly named – their tasting room has one of the most breathtaking views I saw on this trip. The whole valley seems spread below you in a rolling carpet of green and gold. We ended the day at Everett Ridge Winery, probably one of the loveliest locations we visited. 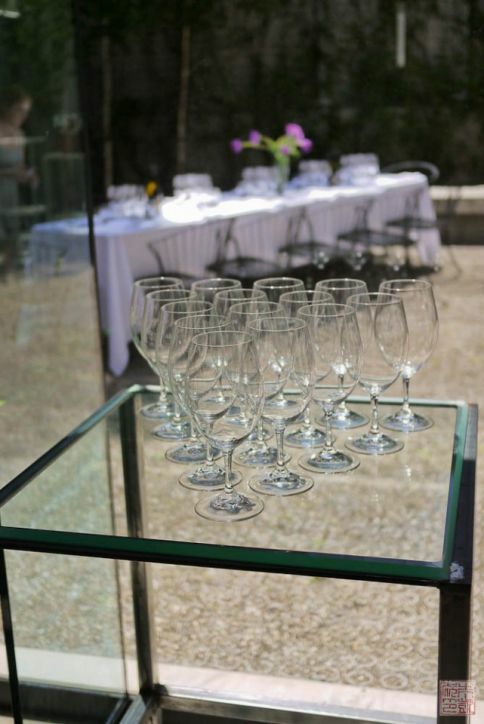 The winery is located on a hill overlooking the valley below, making it a dreamy spot for dinner. The winery is family owned and operated: two of the siblings were on hand to welcome us and share their wine. 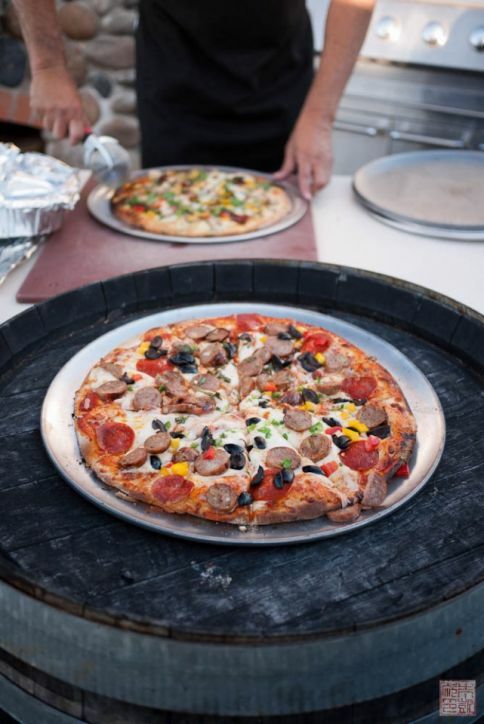 In addition, our dinner of handmade pizzas were made by one of the brothers Chris Sterling with their wood fired pizza oven. Add in wine and dessert and you have a bunch of very content bloggers. 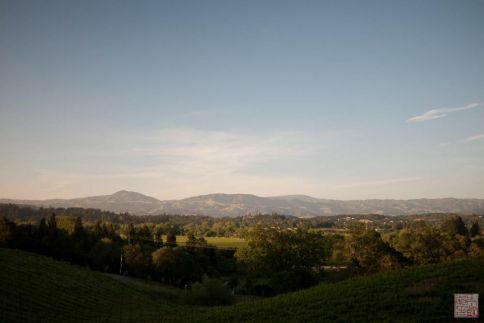 The view from Everett Ridge – nothing like watching the sun set in wine country. This seems like an appropriate way to start the morning: visiting with the chickens at Quivira Winery (no omelets for breakfast, sadly). 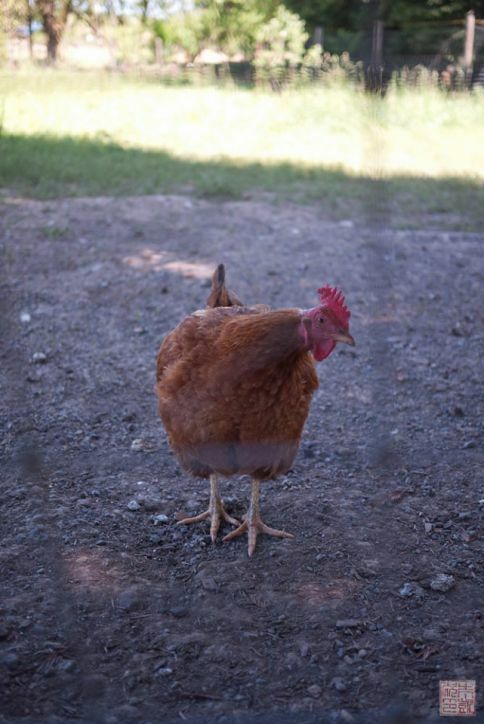 Quivira is devoted to biodynamic agriculture – they are a biodynamic certified farm and have gardens, a greenhouse, and animals on their property, like those chickens. The gardens at Quivira. They make and sell their own olive oils, honeys, and jams all with products they harvest from here. 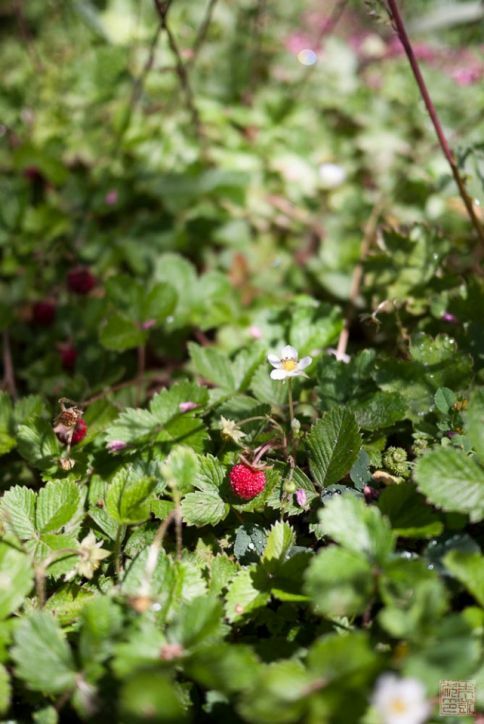 Wild strawberries by Wine Creek, which runs through Quivira. The restoration of the creek is one of Quivira’s many projects, and they’ve been able to help restore it to a thriving salmon and trout spawning stream. 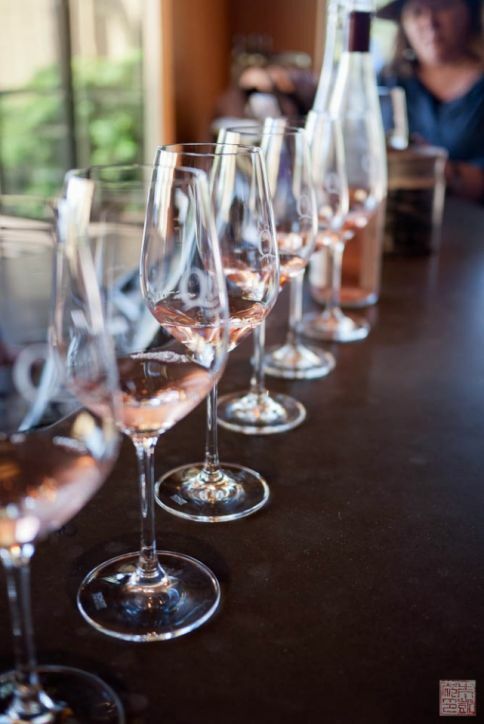 Some wine tasting inside Quivira: their rose is pretty darn good as well. Next stop was Yoakim Bridge Winery, named for one of two bridges that cross Dry Creek. Owners Dave and Virginia live in a beautiful old farmhouse that was one of the original homesteads in the area, and started making wine as a hobby. I really enjoyed discovering all these small wineries on the tour – they all have their unique backstories and were started by individuals who simply had a passion for winemaking. The range of personalities really showed through at all the different places we visited. 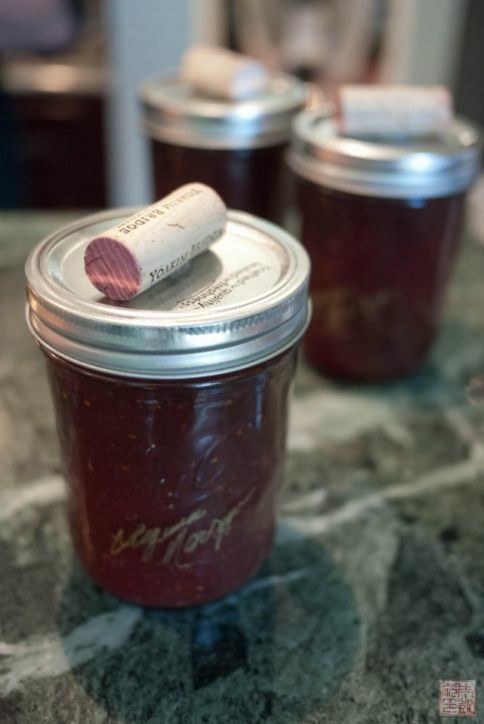 Jars of their homemade meatball sauce, made with their own Zinfandel. I loved this photo by Rob Schneid at Truett Hurst Winery, the last place we visited in the Dry Creek Valley. It fits the funky vibe of the winery perfectly. Truett Hurst is also a biodynamic farm: they have sheep and goats on their property, and a garden that was in full bloom when we visited. Lunch outside on the Truett Hurst grounds provided by our tour bus, Platypus Tours. 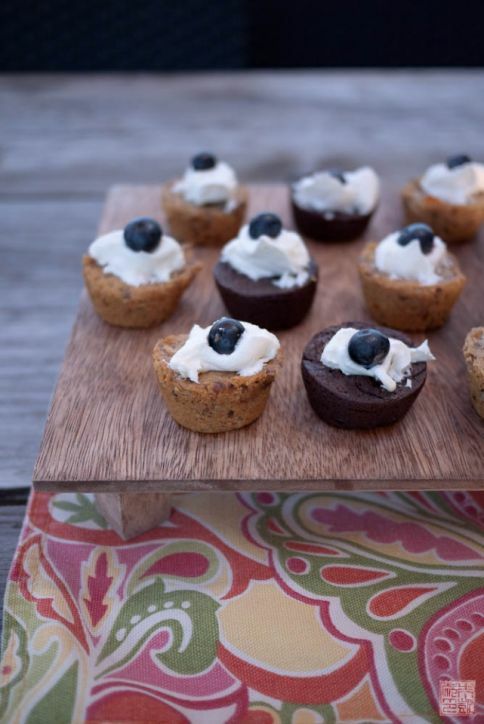 Yes, being a dessert blogger, the only shot I took was of dessert – the little chocolate cupcakes! 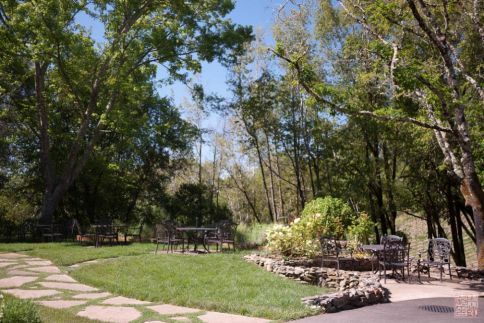 The winery is ideally located next to Dry Creek, and a more idyllic spot for a picnic lunch you could not dream up. 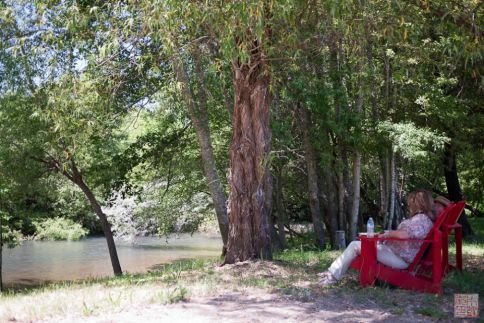 I particularly loved red Adirondack chairs strategically placed in the shade, where you could relax in watch the creek flow by in a sun-and-food-soaked haze. All of us needed a bit of rousing to leave Truett Hurst and continue the winery tour. One of the last stops on our tour was Kendall Jackson Winery, a name that most wine drinkers will recognize. Our hosts there wanted to introduce us to some new and lesser-known aspects of Kendall Jackson, including their new culinary center (housed in the impressive structure above) and their higher end, limited production lines like Highland Estates. Of course, as food bloggers, we were most interested in the culinary aspect. Kendall Jackson set up a table in their gardens for us to sample their food and wine pairing they offer at their center. 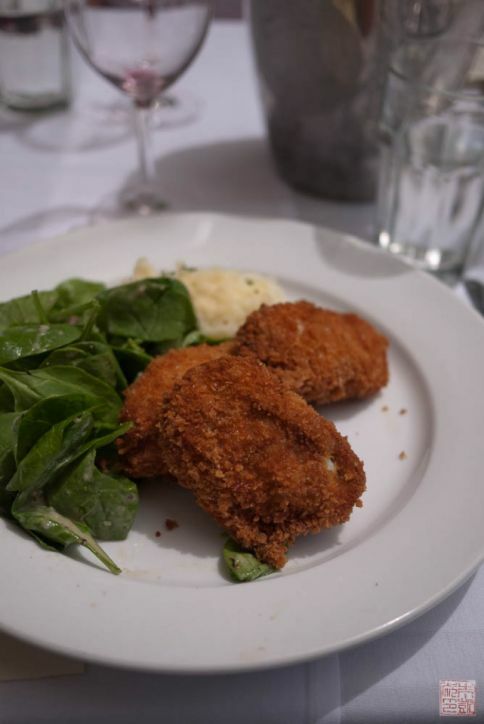 This was our menu – absolutely delish! Next time I go I’d love to try their dessert and wine pairing, just to sample all their sweeter wines. 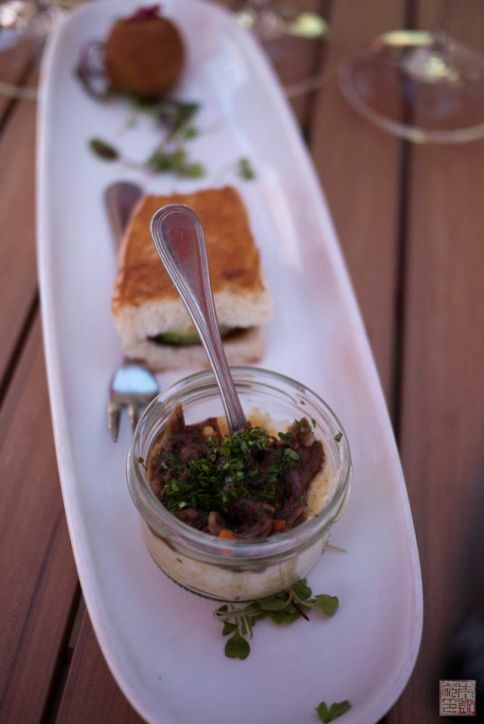 Here’s a shot of three of the dishes, from back to front: the mushroom arancini, the Niman Ranch pork belly slider, and the braised short ribs over grits. It was a close call but I think my favorite might have been the short ribs, because the grits were perfection and because they paired really well with the cabernet they served with it. A final shot of all the bloggers that came along on the Wine Road. It was a great group to hang out with over three days. Although it’s hard not to have a good time in wine country, I was impressed by the breadth and depth of the Wine Road, from the wide range of wineries creating some delicious and unique wines, and the wonderful array of excellent food we got to experience. Thanks to the Wine Road for providing such a great trip for us! I can’t wait to go back to Healdsburg. 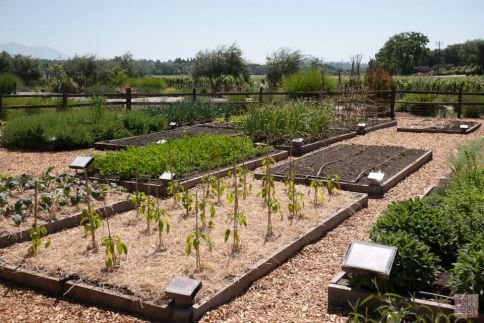 Although we’re moving into the midst of fall, it’s still lovely weather in Sonoma County, and there are some events coming up – a Wine and Food Affair in November and Winter Wineland in January 2013. That trip looks like perfection from beginning to end. 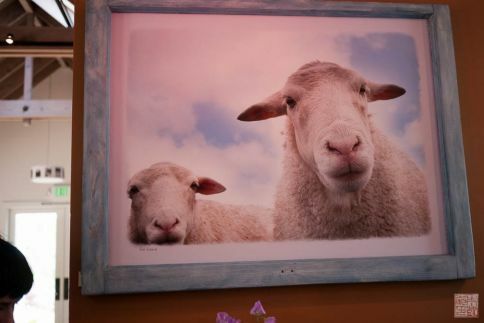 I love all your pics! Glad you had a good time. this looks awesome! like you suspected, kendall was the only name i recognized. still gotta make it out to the west coast for wine country one day. The trip looks wonderful. Glad you had a good time. Looks like a great trip and a great time. That is definitely a beautiful area. My wife and I visited that region on our honeymoon. We both live on the Central Coast of California in Santa Barbara county and work in the wine and food industry. Have you ever visited any of the wineries out here?